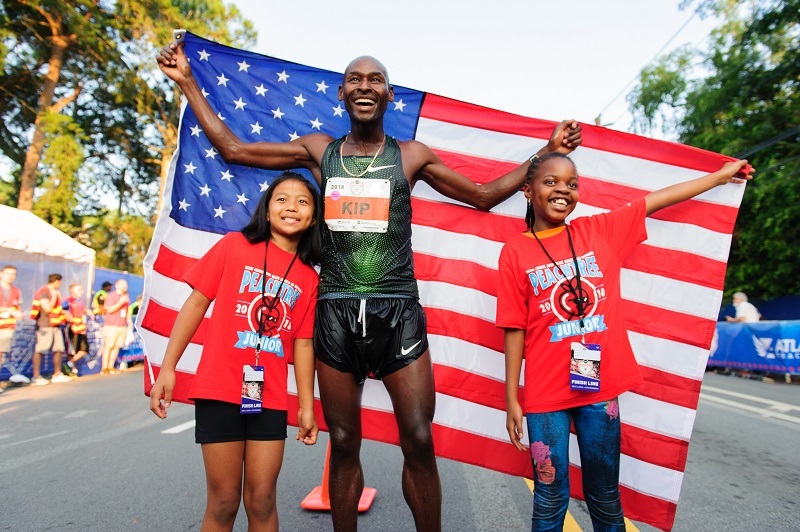 After the AJC Peachtree Road Race came to an end last month, two photos were taken that will go down in Peachtree history: Race winners Bernard Lagat and Stephanie Bruce, wrapped in the American flag, each alongside two children who had competed in the Blue Cross and Blue Shield of Georgia Peachtree Junior. All four children, Shadia Mussa, Deborah Bosombo, Sakariya Hussein and Tha Chin, are students at the International Community School (ICS) in Decatur. They were all part of the ICS team at the Peachtree Junior that won the participation competition for having the most team members at the event. Along with $2500 in funding, the school was given the opportunity to select four children to act as the flag bearers for the Peachtree. 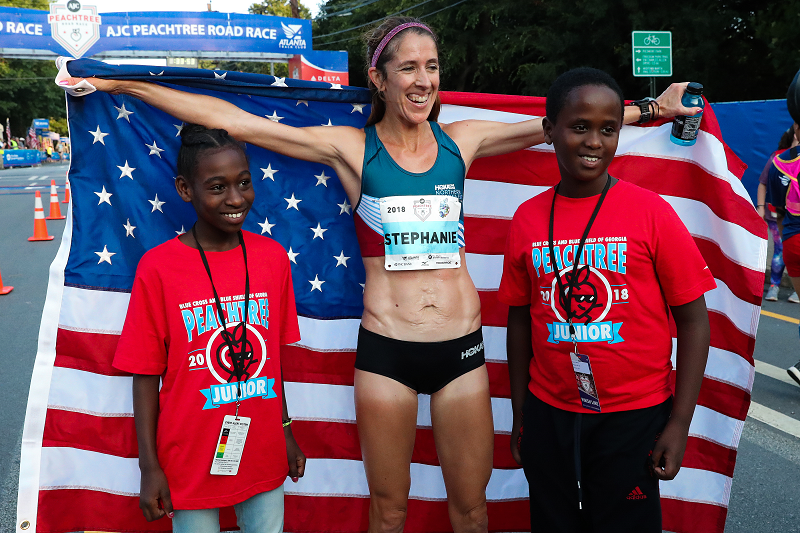 This incentive, established with the goal of creating a relationship between elite athletes and young runners, has led to Kilometer Kids posing with running legends, including Aliphine Tuliamuk, Leonard Korir, Shalane Flanagan, Edna Kiplagat and more. Hussein, who posed with Bruce, has a remarkable story as a Somalian refugee settled in Clarkston after being born in a refugee camp in South Africa. He and his sister, Umulquer (who accompanied Sakariya to the finish line) are part of a huge community of refugees who have found a place amongst local children and other immigrants at ICS, and a running program with Dawn Jones that allows them to build friendships over running. On July 18th, they celebrated their fifth year in the United States and will soon apply for their citizenship, which made the responsibility for the flag even more significant. Neither had any idea heading into the race just what they had gotten into, as Sakariya explained that when he found out it was “one of the biggest races ever” he was kind of scared. When they made their way up the hill on 10th St., they also didn’t realize they were part of an intricately organized scene coordinated down to the second. Just 15 seconds after the winners crossed the line, they had to pass the flag, ensure the flag faces the proper direction, and pose for the photo as Bruce and Lagat draped the stars and stripes around their shoulders. Following the pass, they needed to get into position: Bosombo and Chin alongside Lagat and Hussein and Mussa next to Bruce. The timing worked perfectly, and the four were able to be part of a legendary moment and capture a legendary photo. After that, it was time for them to make their way further down into the chute and watch the masses begin to stream across the finish line. They were amazed by the scene as the elites continued to finish and as 60,000 people flowed into Piedmont Park. All of the kids also left with a visual image of inspiration – Unlike many of the professional athletes they might follow and see pictures of, on the Fourth they were able to see them up close and in person. And they were given an added dose of inspiration by the rest of the finishers of the world’s largest 10K running “just for fun,” as Sakariya put it. Reflecting back, Angel Chin, Tha Chin’s mother came away with a quote that summed up in the infectious nature of running and of the Peachtree. Have a child, parent or coach who should be featured in a future Faces of Kilometer Kids? Email [email protected] and let us know!